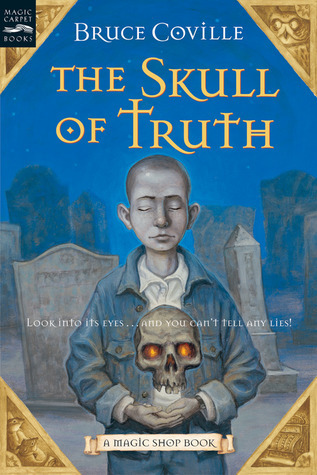 Skull of Truth is definitely one of my favorites in this series right next to Jeremy Thatcher, Dragon Hatcher. It really wan’t what I expected when reading one of Coville’s Magic Shop Books, but I loved it nonetheless. It was a lot more series than all the other ones, and there were tons of “messages” all of which were more obvious than in the other books. Just because the book is more serious I would recommend it to older children or having a parent read the story first. There are discussion about a boy having cancer and loosing his hair, as well as the main character’s uncle being homosexual. There was also a flashback in which a boy’s head was dunked into a boiling cauldron; he was alright, but it turned his hair white. While I was reading this part I thought it was a bit dark, especially because I thought he was going to die, as this was a flashback to someone’s death. It was also a little strange for a children’s book to mention that someone’s grandmother was a stripper! I am not sure what Coville was thinking when he wrote this. I have no problems with any of this, but parents may not be ready to discuss these issues with their children, so I didn’t want anyone to be surprised by the content in the book. I thought the story itself was terrific. It really teaches children about lying and telling the truth and how sometimes it may hurt to tell the truth, but that it is the better thing to do. There are many other lessons that children learn while they are reading this book, and I think that is the biggest reason why I love these Magic Shop Books. I adored the characters, especially the skull, whose name we find out to be Yorick. He is so annoying that he is funny, but at first some might think he was pretty scary. Who wouldn’t be scared of finding a human skull and having to carry it around only to find out that it can talk too! I loved how we really get to know him, especially after he tells the story of how he died. Made the story feel much more personal. Charlie is the main character who changes a lot as the story progresses. His character felt really personal as well because we learn a lot about him and his family, as well as reading about how he handles his friends illness and his uncle’s homosexuality. Also, the rats, Jerrome and Roxanne, were awesome! I love them! You don’t get to know too much about them in this book, but they are pretty interesting characters in Juliet Dove, Queen of Love. I really enjoyed this book in the series, but it is really different from the rest of them so far; I haven’t read them all yet. I strongly encourage you to read this book before giving it to your child to make sure you are comfortable with it. I would suggest that it may be more appropriate for older readers. However, I still loved the book and can’t wait to read the rest of the books in the series. Previous Post My New Blog!